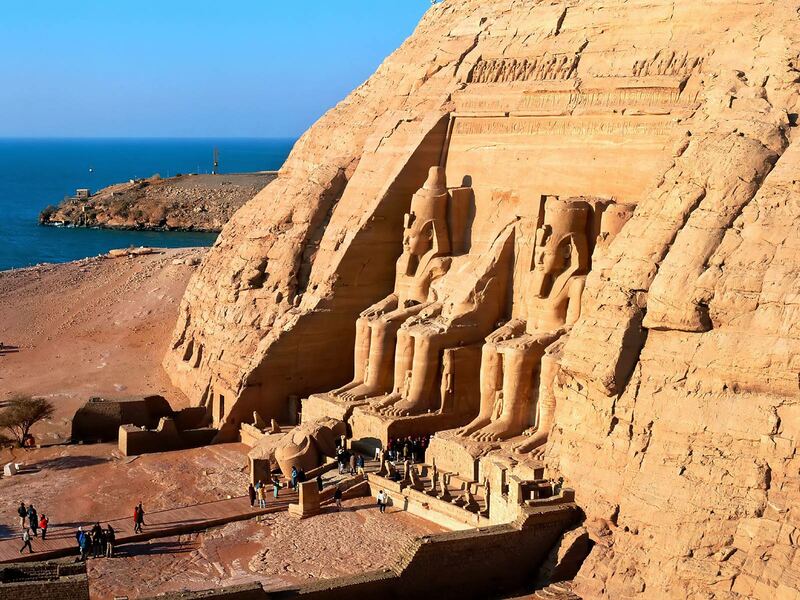 Three hundred and twenty kilometres from Aswan in Nubia is to be found Abu Simbel the most beautiful and imaginative construction of the greatest and most whimsical pharaoh in Egyptian history. This temple is dedicated in theory to Amon-Ra, Harmakis and Ptah but in practice it was constructed for the greater glory of its builder, Ramses the Great (Ramses II). To the Pharaoh’s architects the temple represented a tremendous challenge which, two thousand years later, was to be taken up again by the engineers of the world community in order to save it from the waters of the Nile. In this lonely place lost in the middle of the Nubian desert the temple, which is 38 metres wide by 65 metres long, had been carved out of a single piece of rock. The unusual facade was carved by a «multitude of workmen whose swords had led them to prison» working under the direction of the chief mason. 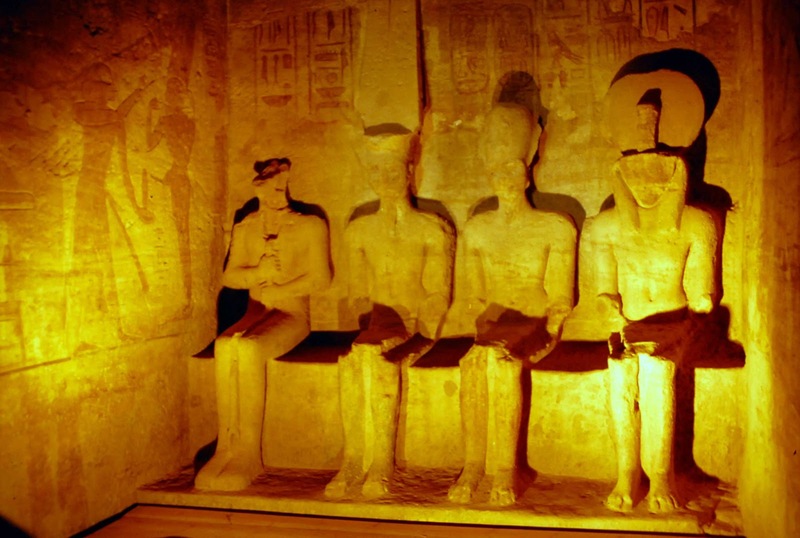 The facade consists of four colossal statues of the Pharaoh -seated on his throne. Each statue is twenty metres high, measures four metres from ear to ear and one metre along the line of the lips. The statues are not only symbols of the attributes of Ramses but are also functional being the columns which support the fagade, some 31 metres high. The work of the stone-cutters and sculptors was followed by that of the painters which at the time of its execution was remarkable for its wide range of colour but which unfortunately has been completely destroyed by the passage of time. Penetrating into the heart of the mountain one reaches the sanctuary where formerly there stood statues of the triad to whom the temple was dedicated together with one of Ramses himself. It was here that what was called the « miracle of the sun » took place. 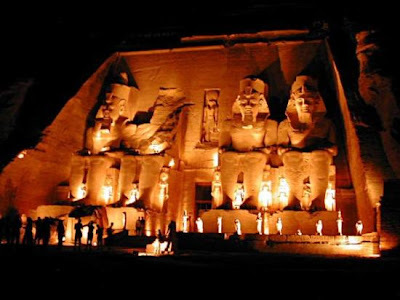 Twice a year, on 21th March and 21th September, at 5.58 am, a ray of sunlight would penetrate the sixty five metres between the entrance and the shrine and bathes Amon-Ra and Ramses II in light. A few minutes later the ray would move on and fall on Harmakis. After about twenty minutes the light disappeared and it is really quite remarkable that the rays of light never struck Ptah, for Ptah is in fact the god of darkness. The temple wall decorations celebrate the military grandeur of Ramses II. The poet Pentaur, serving at the court of the great Pharaoh, composed a long epic poem on the expedition of Ramses the Great in Syria. The poem, written in hieroglyphics, is engraved not only here at Abu Sim- bel, but also on the walls of other gigantic temples, such as those at Karnak and Luxor. During the long wars waged against the Hatti, a belligerant Syrian tribe which had formed alliances with several of the neighbouring populations, Pharaoh Ramses II gave his troops proof of rare martial valour. In the fifth year of his reign the Pharaoh, at the head of his army, advanced against the city of Atech or Quothshou, the ancient Emesus, to the northwest of Tripoli. Betrayed by false refugees (Bedouin spies in the pay of the king of the Hatti), Pharaoh fell into an ambush and was suddenly surrounded by enemy troops. Ramses found himself alone with his personal guard, consisting of seventy- five war chariots, against an enemy possessing more than two thousand. «Then» writes the poet Pentaur in exaltation of the glory of his lord, «extending his body to its full height, Pharaoh arrayed himself in the proud armour of the warrior. And whipping forward his chariot drawn by two horses, he flung himself into the fray. He was alone, completely alone, with no one beside him! His soldiers and his bodyguard watched from a distance as he leaped to the attack and defended himself like a hero. Two thousand five hundred chariots, each bearing three soldiers, surrounded him and crushed tight about him to cut him off. But he, undaunted, had with him neither princes nor generals nor soldiers! ». In this moment of supreme danger, Ramses then addresses this fervent prayer to the supreme god of the pharaohs: «0 thou, divine Amon, Lord of eternity, creator and organiser of the world, God who provides all, Lord of all the kingdoms of the earth... see, I am alone!... Are you not my father and I your son?... My arm has always done thy will. Have I not rendered you homage with my offerings? Remember the thirty thousand oxen sacrificed in your name and the temples of enormous blocks of granite I have raised to thee! Count the obelises I have erected in your honour! O divine Amon, now that I am alone and abandoned by all, I extend to you my hands and my prayer. Are you not stronger than a thousand archers, than thousands of heros?...».